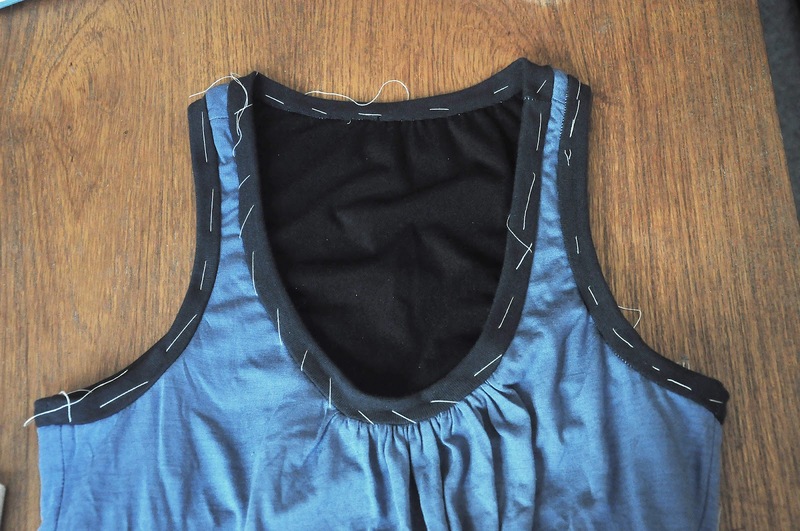 Here comes the tutorial on how to sew a built-in bra top on a workout top. 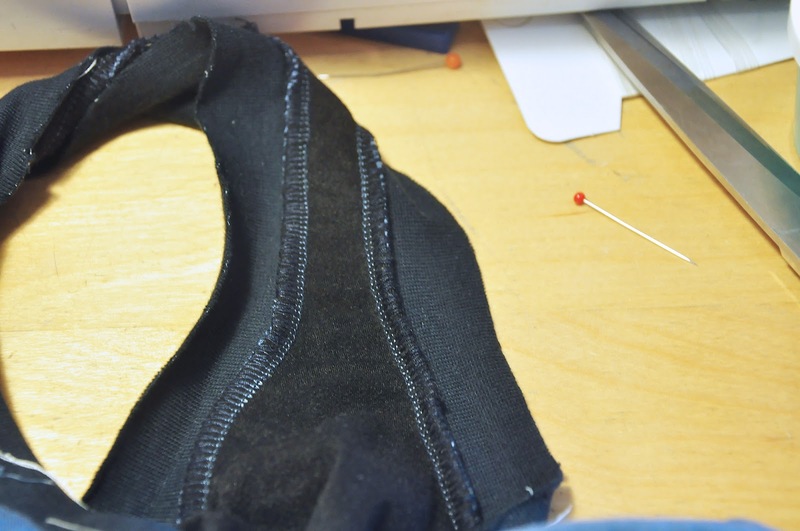 This is the easiest possible bra to make, and if you make it snug enough and add an extra layer of power mesh/net it will provide very good stability for at least medium bust. Ribbing or fold-over elastic to cover the edges of the top. 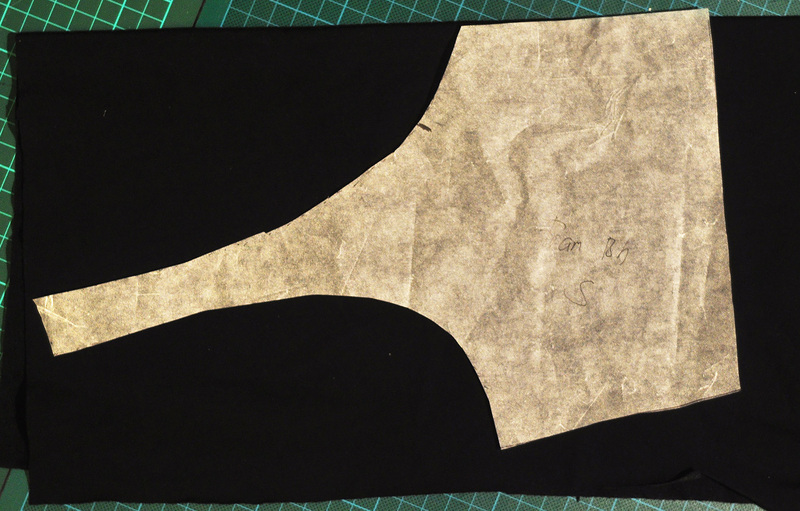 Step 1 – Create a bra pattern and cut the pieces. 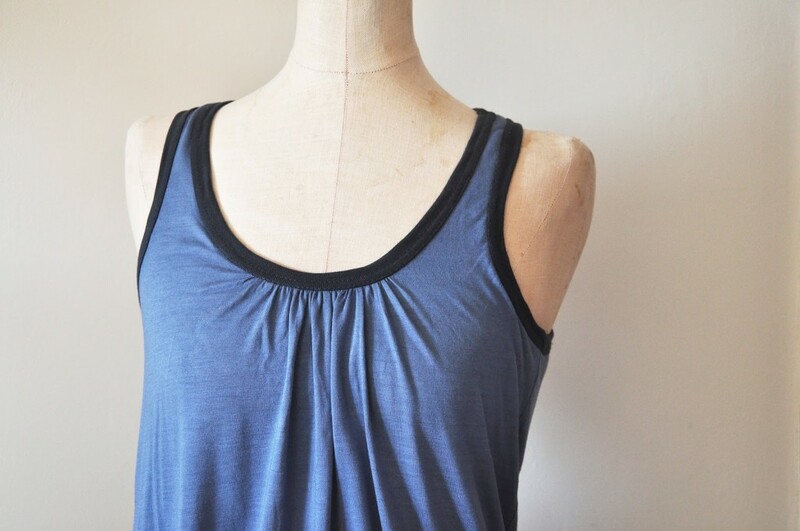 Make separate bra pieces from your tank top pattern. 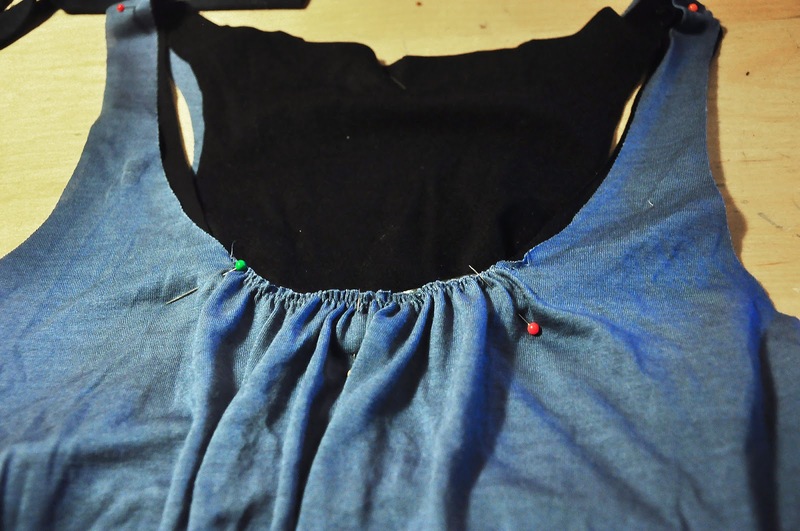 The side seam should be about 12-15 cm long (around 5 inches) and taken in so that the circumference is smaller at the hem (to better fit your under bust measurement). I think around 2-3 cm (~1 inch) on each side is a good start. But the best way is to use a ready to wear tank top with a built-in bra that fits as a guide. 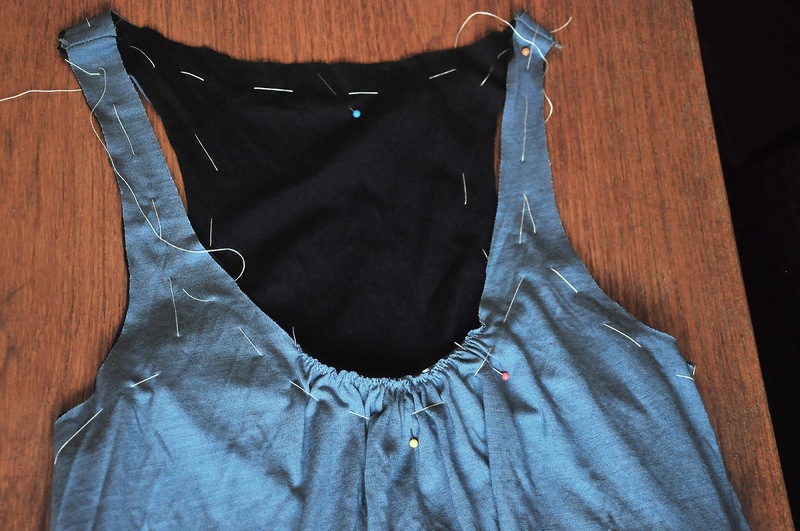 Sew the side seams and shoulder seams. Then attach the elastic. Again use your own body as a guide for the perfect elastic width. There should be some negative ease. 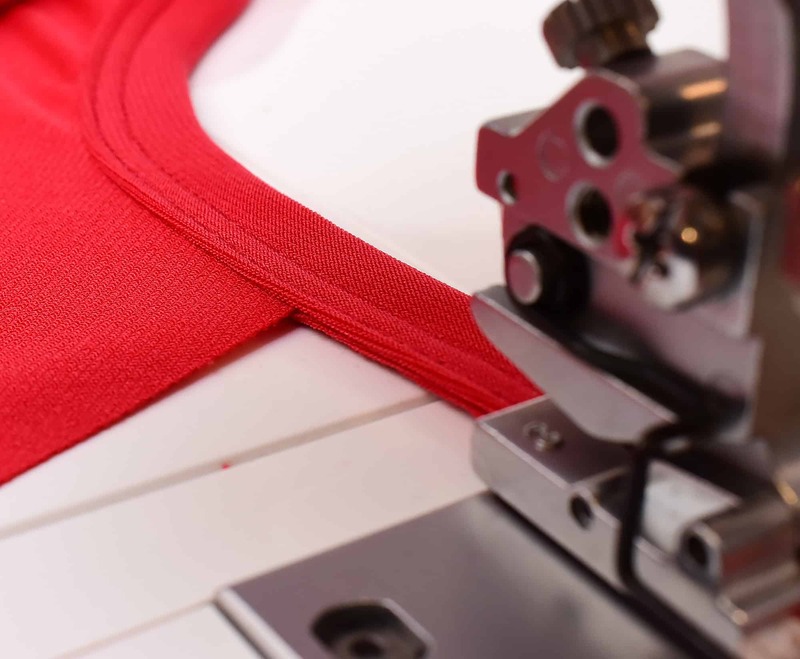 I use the serger flatlock seam to attach the elastic as it creates the smoothest seam. But a zigzag or even better a 3-step zigzag will work just as well. Just align the bra and the top to prepare for the binding. I find basting really helpful to keep the pieces in place. 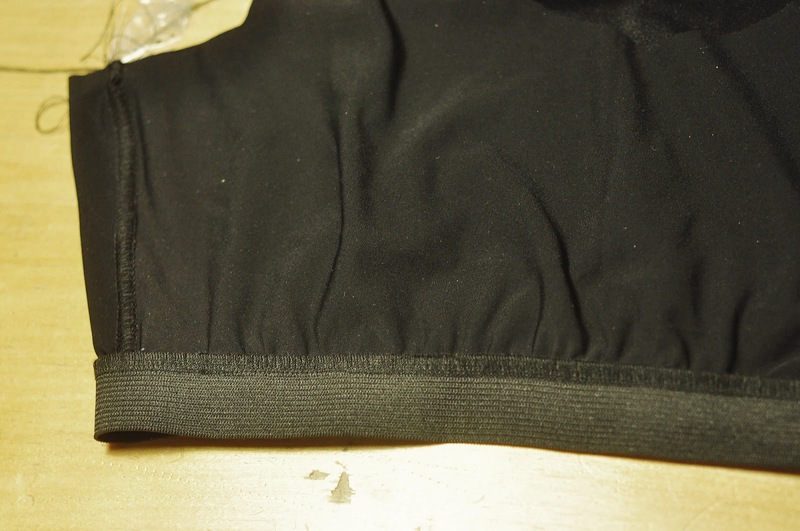 The length of the ribbing needs to be shorter than the actual seam it will cover. 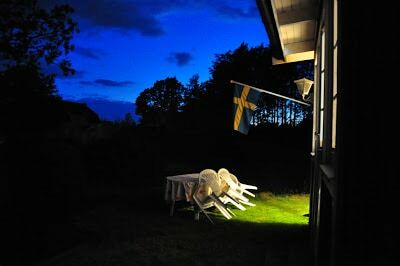 How much shorter depends on what fabric you use, but reducing the length to around 80% will work for most ribbings. Since my ribbing fabric was pretty thick, I just did one layer, folded it over and then covered the edges with a coverlock seam. 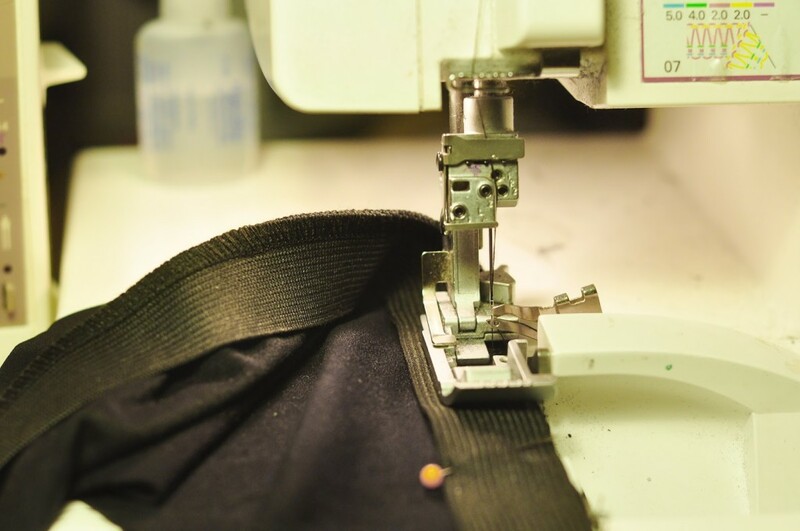 But the best and most professional look is to sew the binding as a double layer, fold over and top stitch. For a self fabric binding this would be the optimal method. If your machine has a binder attachment this will come useful now. I used basting again as a safety measure. A coverlock two needle seam will yield the best looking top stitching results, but I have also used a regular sewing machine zigzag seam quite successfully. The finished top. Yes it requires a few steps and perhaps some basting but the end result is totally worth it! Oh thanks for this. I have learned something new for sure. I especially like how you put the binding on. I'm going to try this in some swimmers with lycra.